A seasonal treat for a perfect ending to your holiday feast. My taste testers seemed to like it, so this recipe is a keeper! I always see persimmons in the grocery stores this time of year and have wanted to try making a gelato flavored w/ them. I used the Fuyu variety. If you decide to try this recipe, make sure you select ripe persimmons, otherwise they will be astringent. Lebkuchen are a German holiday cookie that originated in Nuremberg over 600 years ago. They’re soft gingerbread w/ additional nuts and spices. I found the ones I used in this recipe at Trader Joe’s. You could easily substitute the Lebkuchen w/ ordinary soft gingerbread, or leave them out if you’re not a fan of the gingerbread flavor. Personally, I love gingerbread, not only because of the flavor, but also because it brings back fond childhood memories of Christmastime! 5) In a food processor puree the persimmons, then pulse in some of the gelato mixture to thin. 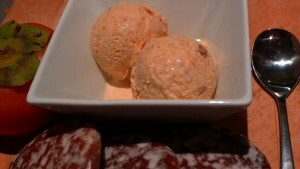 Stir puree into the remaining gelato mixture, blending well, and chill in fridge for at least 4 hours or overnight. 6) Churn mixture in ice cream maker according to manufacturer’s instructions, adding the Lebkuchen chunks when mixture starts to freeze. 7) Pour gelato into a 2 quart plastic container, stir to evenly distribute the Lebkuchen chunks, then place a piece of parchment paper cut to size on the surface of gelato (this will reduce air exposure and prevent ice crystals from forming on the surface of the gelato). Seal container and freeze until firm.